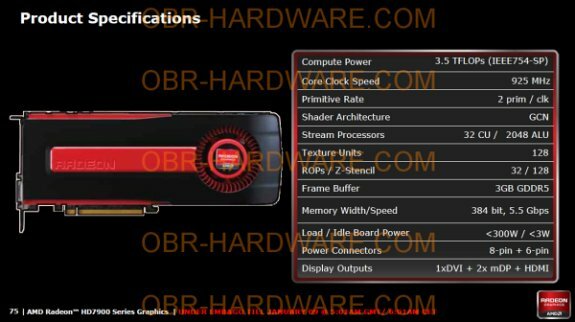 TPU found a slide with the specifications of AMD's forthcoming Radeon HD 7970. The 28nm chip is clocked at 925MHz, with 3GB GDDR5 and a TDP of under 300W. There are 2048 stream processors, with 32 computing units each holding 64 SPs. The memory bus is 384-bit and the card draws power from a 8-pin plus 6-pin PCIe power connector. It also sports a 3.5 TFLOPs precision floating point. Which would put it well beyond the NVIDIA flagship single GPU solution. The slide states the a ROP count of 32, against an earlier speculated count of 48. This could be because AMD may have delinked ROP clusters from memory bus. The cooler itself is under the trademark AMD black shroud so there is no way to see if it uses the rumored "vapor chamber" as seen in after market solutions.